[Go Back] [New Search] Details for Torii Kotondo (1900-1976) "Nagajuban- Long Undergarment- Variant 1"
The 4 colour variations were published by Kawaguchi alone. 169.1 in The Female Image. This is a colour variant, by Kawaguchi. An elegant beauty seated on a zabuton holds a fan with an image of Mount Fuji. 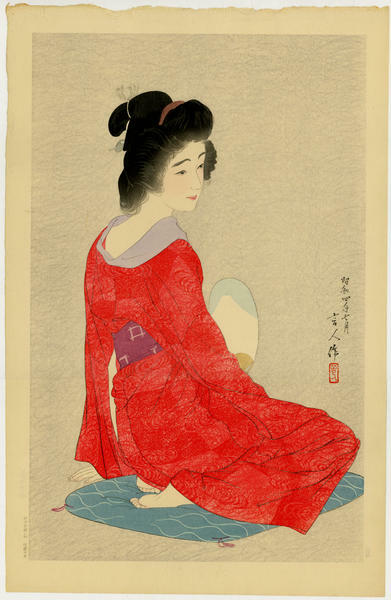 Her softly-patterned red robe is one of five color variations of this print. Publisher: Kawaguchi; with a limited edition seal, verso reading #188/300.